The Anunnaki make ice-pictures in space and crop circles on Earth to ready us for their return. The crop circle you see with this post spells Enki and thus proclaims his age, the Age of Aqarius, in the crop. Leakers, however, say the clandestine military will generate its own crop circles with HAARP technology. HAARP crop are crap circles. Michael Lee Hill writes: “Enki Ea” A Sumerian Anunnaki ET/God Shows Up In Recent 2011 Crop Circle! “The Poirino 2011 Crop Circle contains some coded information. Among other things, the outer rim contains the names “Enki Ea”, coded in ASCII. These are names of a Sumerian god: Lord of the earth, god of water, creator of mankind. “A new ASCII code was drawn in crops at Poirino, Italy on June 20, 2011, and seems to identify the crop artist as “Ea” or “Enki” who was a tall, blond, extra-terrestrial god in ancient Sumeria. 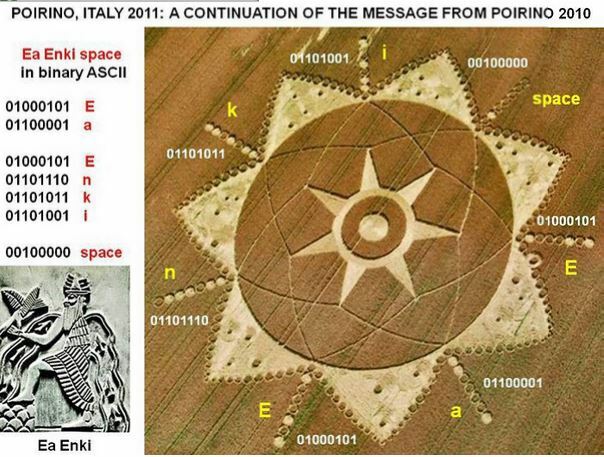 “A new crop picture which appeared near Poirino, Italy on June 20, 2011 shows at its centre a large seven-pointed star, which clearly resembles another star-like crop picture from Lane End Down in southern England during July of 2005. That 2005 crop picture predicted the outburst of comet 17P Holmes two years later in October of 2007. “Seven rays along the outside of that new crop picture at Poirino are written in eight-bit ASCII code, and seem to identify the crop artist as “Ea” or “Enki”, who was a tall blond extra-terrestrial god in ancient Sumeria. 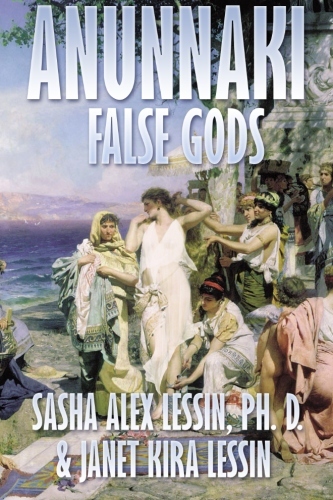 “According to ancient legends, he and NINGARHSAG created modern humans by hybridizing sperm from the male gods with eggs taken from local aboriginals, already living on Earth tens of thousands of years ago. “That amazing crop picture also shows a series of “stars” around its seven edges, but it is not clear whether those symbols represent astronomical images around an exploding comet (as for Lane End Down 2005), or rather some clever mathematical code? Counting each set of “stars” individually, we seem to see “5.334444”. Click this arrow to get the scoop, step-by-step, that'll blow your mind. The Youtubes take awhile to come in; exercise patience and receive them as a reinforcement to the virtue of patience. Our DNA, planet’s location, telescope type’s on right, Circle Maker’s on left. They have bigger heads. When we sent our 2-stranded genome and planetary location digitally into space, a crop circle response showed the 3-stranded genome and planetary location of the consciousness creating the circle. *800 degree hot plasma penetrates the Earth beneath a crop-meadow. *The plasma strikes next to water or on fields that have water under them. *The heat hits the water, turns it to steam, which gushes up, makes the plants pliable, and twists them into meaningful patterns. *All bugs are vaporized; porcupines caught in forming crop circles fry (Don’t get in the middle of crop circle a-forming). Click arrow, hear Barbara Lamb clue us in to the latest in crop circle and alien contact experiences.